In stock -This product will ship today if ordered within the next 23 minutes. 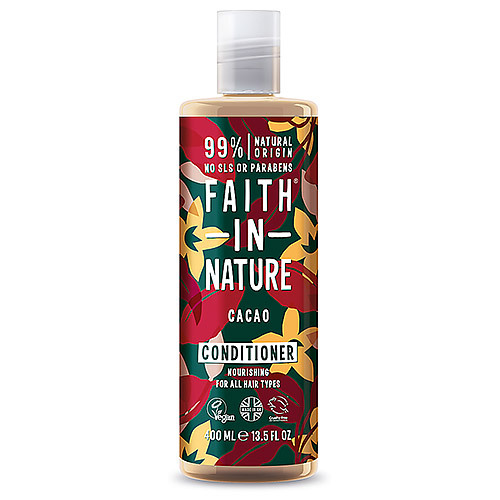 This luxurious cacao conditioner is a blend of organic cacao bean extract and vanilla infused with sage to nourish your senses. Packed full of wonderful aromas to soothe your day - a sumptuous treat for your hair and scalp. Aqua (Water)***, Cetearyl alcohol*, Brassica campestris (rapeseed) seed oil*, Theobroma cacao (cocoa) extract*, Salvia officinalis (sage) leaf extract**, Vanilla planifolia fruit extract*, Melaleuca alternifolia (tea tree) leaf oil*, Cetrimonium chloride*, Sodium benzoate, Potassium sorbate, Citric acid*. After shampooing, apply conditioner to damp hair. For best results, leave on for 5 minutes then rinse well. 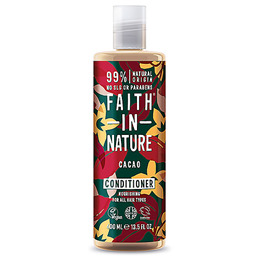 Below are reviews of Faith in Nature Cacao Conditioner - 400ml by bodykind customers. If you have tried this product we'd love to hear what you think so please leave a review.